Starting in November, Joon is offering a new family-friendly modular seat option called Cosy Joon. On some four-seat rows on Joon's A340s, two side-by-side seats can be transformed into a play area or bed for two children between two and five to six years of age. Cabin crew can convert the child's seat headrest into an additional seat, filling the space between the rows with a surface area of approximately 105 x 76 cm. An overlay mattress and seat belt extension is also provided to passengers. 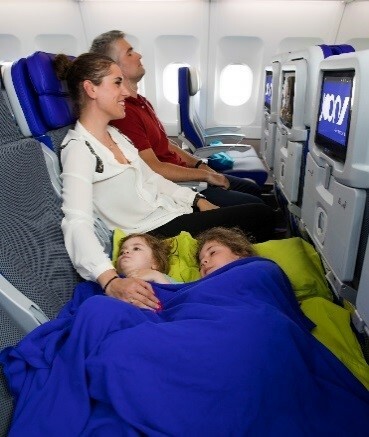 Sixteen Cosy Joon seats are available on Joon long-haul flights operated by an A340. Families with one adult and two children or two adults and two children can book these spaces 55 hours before flight departure for €20 including VAT per seat from Air France or their travel agent. Flying Blue Silver, Gold and Platinum members and their families listed on the same booking file can book Cosy Joon for free when checking in online 30 hours before departure, subject to available seats.